This rare print of La Terre is sometimes used as a reverse print with the Mother and Child pattern, usually on larger pieces. 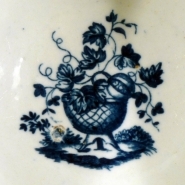 This pattern ulimately derives, in concept, from an early on-glaze Worcester print, although the execution of the design is markedly different. The interior print depicts a three-footed flower bowl. This Worcester bowl is printed with the rare three figure version of the Mother and Child pattern, which is usually only seen on larger pieces such as this slop bowl. The Mother and Child was a popular pattern at Worcester and Caughley and unmarked pieces can be difficult to separate. The large pot filled with fruit behind the seated figure of the mother is of different design at each factory. Also, the usual secondary prints of the two factories, showing arrangements of bowls vases and other objects, are very different (see Geoffrey Godden's Caughley and Worcester Porcelains plate 255). However, larger pieces at both factories sometimes use La Terre as the secondary print and these need to be more carefully examined to distinguish them: the pagoda and the floral arrangement in the kneeling figure's vase are both larger in the Worcester version.